This is the best place to stay in all of West Bay Beach. REPLY: Thank you! This is a first class opetation. They are professional and friendly, and will go out of their way to make your stay pleasant and comfortable. The property was neat, clean, and comfortable. We reported a water leak and it was addressed and fixed immediately! The staff was very concerned about our comfort and a staff member was there the entire time repairs were being made. Fernando was very attentive and friendly. He was sure to check in with us periodically. I'm thinking of putting a bid on it! After walking the beaches and visiting other rental properties, I truly believe the villa itself and location cannot be beat. REPLY: Thank you very much, we're glad you enjoyed the property. Restaurant at nearby beach (Meridien hotel) was not very good and we may have gotten sick from the food. Friendly staff, beautiful house. Great experience! It may be a good idea to suggest to renters to rent a car or put them in touch with a car service since the location is a bit isolated. Other than that, we had a very positive experience. REPLY: Thank you for your review. Our guests are advised as to the location and the availability of a rental car. We have recently struck a deal with a local taxi service that will be available to our guests at any time. We appreciate the suggestion! Fernando was amazingpatiently answering our many questions via email! He would check in with us during our stay to make sure we had everything we needed. He couldnt have been more organized and On top of things. Eleven of us stayed at Sunset House over Christmas 2018. It was amazing. The house had everything you could want and more. There was plenty of room for everyone to have their space. So many activities to do, too. The best was the snorkeling from the dock! The reef was only 1/4 mile from the pier. And it was so amazing. No need, really, to go to west bay! Of course if you wanted to...just take a fifteen minute walk! Honestly, the house and its location was perfect. It was nice and quiet yet offered easy access to either west end or west bay. If I could live there, I totally would! Oh, plus...puppies ran amok! So fun to wake up in the morning and be greeted by various pups on the dock. Honestly, we looked at surrounding homes and really Sunset House was the best! Beautiful beach, plus private pier. Every day would start with coffee on the pier, every night would end with drinks at the bar! It was really, really nice! REPLY: Thank you very much, we couldn't make a nicer review ourselves! We're so happy you enjoyed your time at Sunset House and hope you come back. Fernando was awesome in providing us recommendations, coordinating airport transportation, grocery shopping, Blackie home cooking, fishing charter. We were well taken care of from the initial planning all the way to departure. You have a wonderful staff who makes sure guests are comfortable, relaxed and experiencing the most of their vacation! Sunset house exceeded all our expectations. The location was perfect. The house has everything you could possibly need. We were spoiled! The house feels secluded even though there are neighbors. The year round neighbors were friendly. We had a group of 11 (7 adults & 4 teens 10-18 yrs). The teens had the guest house to themselves and loved having their "own place". The house was well appointed and updated. It is well cared for. REPLY: We are happy you all enjoyed yourselves, thank you for your kind review! Always a pleasure. REPLY: Thank you, nice to have you! Again, our only complaint was the beds being very uncomfortable. Otherwise, we were very pleased with the property and Island House staff. 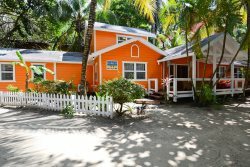 As indicated before, wed stay at this property again if the beds/mattresses were replaced but regardless of where we stay, well return to Island House Realty for our rental needs when we return to Roatan! They are an absolutely exceptional realty company to deal with and each and every one of the staff we dealt with gets our 5-Star rating!! REPLY: Thank you very much for your kind review. Based on your review, the owners will be replacing the beds at the end of October when they have the interior remodeled. Thanks again and see you next time!